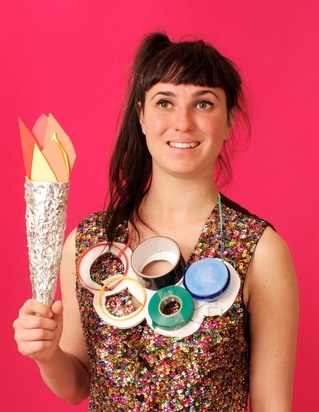 Presenting at this year’s Melbourne International Comedy Festival is Madeleine Tucker’s Olympik Phever. In this, Madeleine is given her big chance of filling in as a late-night presenter for an Olympic Games TV special. The show starts off well: Tucker’s “flags of the world” jeans were an amusing thought and her “jeans of the world” flag was then a nice touch. Her initial song, “Race to the Race”, whilst a little repetitive was enjoyable enough but didn’t really get the laughs and therefore failed to hit the right mark. It is Tucker’s live sugar dispenser commercial that is the absolute highlight of this unfortunately otherwise lack-lustre show. Everyone was in stitches over this section and it’s a shame the rest of Olympik Phever didn’t deliver such strong reactions. The set design was fairly impressive with Tucker performing her show from inside a giant television set. Clearly, much time and effort had gone into creating this. Her creative and detailed costumes, such as the sugar dispenser and her toast outfit, did not go unnoticed or unappreciated either. To her credit, Tucker keeps the energy high and solders on even when some of the jokes fail to get the laughs – her Olympic flame in the mail segment being one of them. I’m not sure how much this show has changed since its debut at the Melbourne International Fringe Festival last year but it seems some refinement to the material is definitely needed. Tucker seems to whizz through a lot of material but perhaps focusing more on what obviously works with her attendees and using that would make Olympik Phever more audience-friendly. I like to go in with an open mind and not have too many expectations when I go and see a new show. I’m not a fan of the Olympic Games and I have not watched them since 1992. I happily took a chance on Olympik Phever because I thought it would be an irreverent look at the event. It wasn’t, but this isn’t why I didn’t warm to it: it comes down to the material and unfortunately this show doesn’t go for comedy gold.